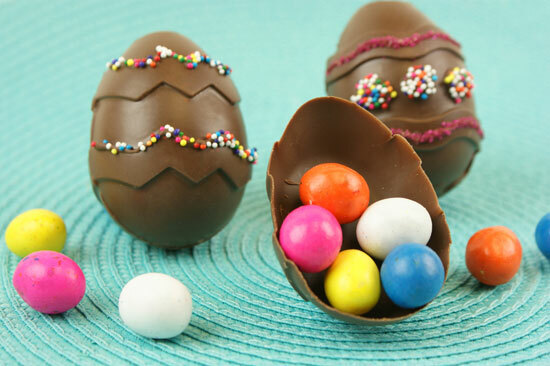 A hollow chocolate egg that you can fill with...well, whatever you want! Make it a fun surprise! 1. Melt Chocolate CANDIQUIK® in Melt & Make™ Microwaveable Tray according to the directions on package. 2. Spoon a small amount of CANDIQUIK® into each of the silicon molds; push the coating up the sides of the mold with the back of your spoon. Bring the coating almost to the top of the cup, but not over the edge. Repeat with all remaining mold cavities; let set. 3. Once completely set, carefully peel the silicon baking mold away from the CANDIQUIK® coating and ‘pop’ out the chocolate eggs. 4. Using the back of your spoon, spread the chocolate around the edges of one egg half, fill with candy and place another egg half on top, gently press down and set aside to dry. 5. Using a toothpick dipped in CANDIQUIK®, apply coating where desired and sprinkle to decorate.